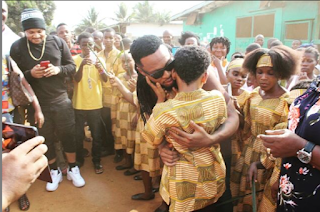 Singer Flavor has opened a school for the blind in Liberia, in honor of his now adopted child, Semah Weifur. Flavour and Semah crossed paths in 2017 during a peace concert where Semah performed his iconic single, ‘Mama’. Flavour was very touched and impressed by the youngster’s talent. Flavour then featured him on ‘Most High,’ a gospel track off his fifth studio album, Ijele – The Traveler. Semah was born blind and into poverty. For years, he has been in the care of Monrovia-based NGO, Christian Association of the Blind (CAB). Life hasn’t been kind to him but young Semah hasn’t allowed that kill his spirit. In spite of his circumstances, Semah’s dream is to become a singer.